If you’re a dedicated bibliophile, its likely that you’ll always be collecting books. But where to store them? Once you run out of bookshelf space, titles often end up living under beds or in wardrobes – sometimes just in stacks. 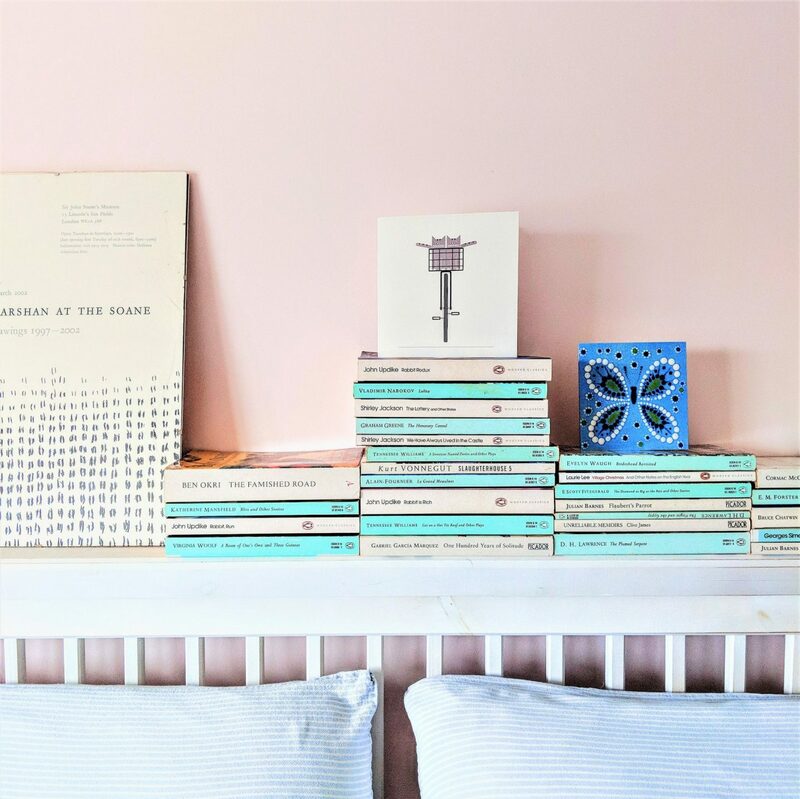 We’ve been there so we’ve listed our favourite creative ways to display books in this post (the photos were all taken in our own house). Note that this post includes affiliate links. It’s moveable so you can wheel it around the house easily. There are several shelves which means we can all have a section. If I had one myself, then I’d categorise each one – either by month, or genre. You can fit around 40-55 books in the entire trolley (an average year’s reading for me). The trolleys come in different colours so you can match them with your decor. Since I posted a picture of our book cart on Instagram, lots of people have asked me where I bought it. We originally thought we’d order an Ikea model but found a cheaper option on eBay. 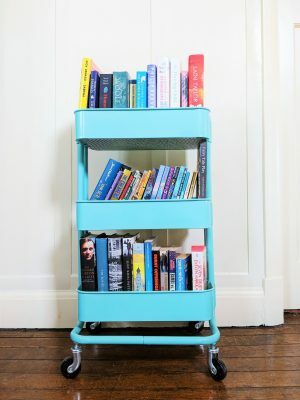 See here for the book cart that we have (we chose blue which is basically turquoise). This only seems to ship to UK customers so I found a US equivalent here. So far, our trolley seems to be quite sturdy but it’s always wise toto che out reviews before buying as we can’t vouch for ongoing standards. If you have a bed with a wide bedhead then this can provide another creative way to display your books (with a health & safety caveat!). The beauty of this – as with all these solutions is that you can change your aesthetic easily by swapping spines. Modern and Shaker style beds are the best for this but you can buy or make bespoke shelving to suit your room. The other advantage of this method is that you’ll have all your books lined up for bedtime reading. In this arrangement we’ve chosen to stack the books horizontally rather than vertically as this makes for more stability. It also allows you to vary your heights. For an extra touch, mix and match your spines with cards and prints. 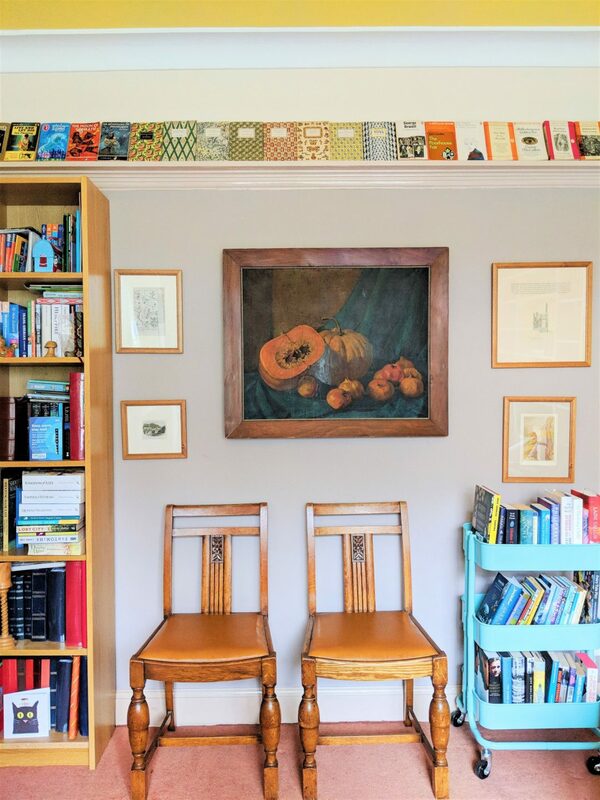 My husband, Al, came up with this ingenious way to display our vintage paperbacks. Our house was built in the 1920s so it has a generous picture rail, deep enough to prop books on. We’ve managed to store about 40 books all the way around the room. What I like about this style is that it forms a patterned border and shows off the beautiful cover artwork. 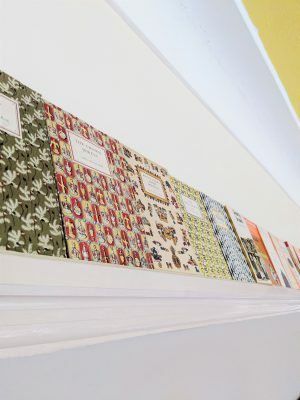 If you don’t have an original picture rail then you could install one – maybe in a bedroom, dining room or cloakroom. Again, you can vary the designs and colours depending on your interior decor. These patterned King Penguins match our eclectic room very well. The main downside of this is accessibility and dust, but no one will see the it when it’s above their head! Another outward-facing idea. Now I admit that this isn’t exactly a space-saver. Hear me out though! What you have with this item of furniture is versatility. Shelves, drawers and a cupboard. Plus you can move it around. We’ve displayed books in all sorts of ways on our dresser – to suit our mood and the season. Rather than pay for an upcycled piece, we bought an old oak dresser and re-painted it with Annie Sloan chalk paint. The benefit of this is that you don’t need to strip any varnish first, although there is a yellowish bleed-through with light colours. I anticipate that we’ll keep on re-designing our dresser as our tastes change. It’s not a cheap investment, but it’s one that you’ll want to hold onto. I hope these have given you some ideas for your own book displays. We’ve had lots of fun trying to find new creative ways to display our books and will add more as we discover them. If you’re still stretched for space then you might like to check out our post on culling your books (although we realise that this is always a last resort!). Conversely, if you want even MORE books then here’s our feature on how to collect books on a budget. Tell us your favourite unusual way to showcase your bookish collection below. This was such a useful post! I have piles of books growing around the house and my GF is getting a bit peeved with the clutter… Time to implement some of these. I’ve come across your IG/blog a couple days ago while searching for family bookstagram inspiration (hoping to start one on my own soon) and I must say I’ve fell in love immediately :-)). Your ideas for displaying books are great, finally I know how to use the troley we used to have in the kitchen. I’ve got mine at IKEA, it looks very similar to your https://www.ikea.com/us/en/catalog/products/30401789/. I highly recommend the trolley! So glad to find your blog via Avalinah’s Books! Blimey! I wonder why they’re so much! Is it import taxes? These are great ideas, and such beautiful decor too! Thank you Dee! Sometimes bookshelves just aren’t enough!